In today’s society, people and organisations increasingly undergo processes of transition. Experiences of change affect all areas of life: our jobs, relationships, status, communities, engagement in civil society, lifestyles, even understandings of our own identity. Each person must expect and make ready for transitions, engaging in learning as a fundamental strategy for handling change. This is where lifelong learning steps in. From career guidance to third age programmes, from ‘learning to learn’ in kindergarten to MBA, from Mozart for babies to gender re-assignment counselling, people face a crowded world of learning activities designed to help them through transitions. Researching Transitions in Lifelong Learning presents new research from Britain, Australia and North America. The authors include leading scholars with established international reputations - such as Kathryn Ecclestone, Sue Webb, Gert Biesta, W. Norton Grubb, Nicky Solomon and David Boud - as well as emerging researchers with fresh and sometimes challenging perspectives. 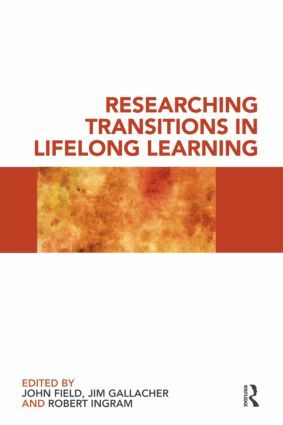 While emphasising the complexity and variety of people’s experiences of learning transitions, as well as acknowledging the ways in which they are embedded in the specific contexts of everyday life, the authors share a common interest in understanding the lived experiences of change from the learner’s perspective. This volume therefore provides an opportunity to take stock of recent research into transitions, seen in the context of lifelong learning, and outlines important messages for future policy and practice. It will also appeal to researchers worldwide in education and industrial sociology, as well as students on courses in post-compulsory education.